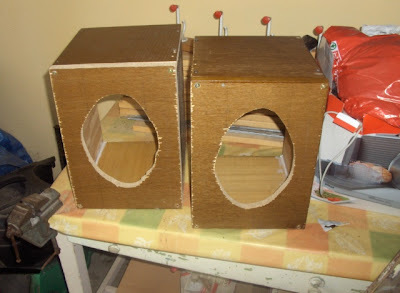 Karosium: DIY Speakers Part 1. Housing made out of scrap (not to mention low quality, and pretty old) MDF from some trashy office furniture. Cut the boards out with a jigsaw, screwed them together, filled the gaps with wood putty. Gave it a run with a power sander for good measure. Upholstered them with some white fabric. 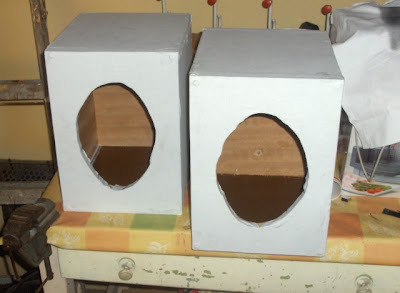 (I know it's a bad choice, but it's what I could get for free and I don't intend to spend much on this ) I haven't decided yet whether I'll paint it over black. 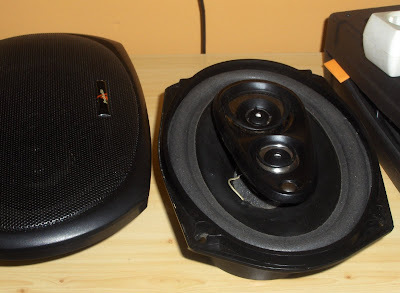 These are the speakers that will go in there. They're some leftover "5way" car speakers with a "ProAudio" brand. Overcomplicated Battery Protector Take 2.